Sweet potato casseroles are a necessity for any big family gathering — from Thanksgiving to Christmas to Easter — including mine. 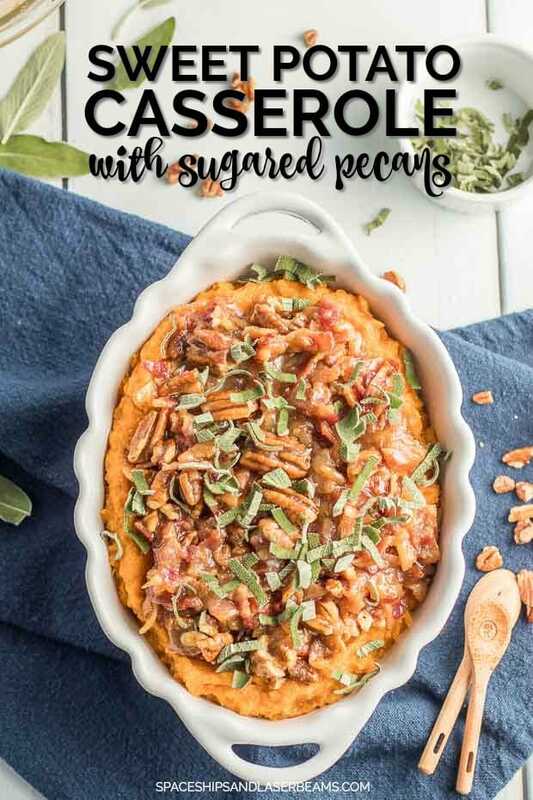 This sweet potato casserole recipe comes with nuts for some added texture and some bacon for a fun saltiness that will give your casserole an extra “umph”. The cayenne added into the topping gives it a bit of a kick, too. 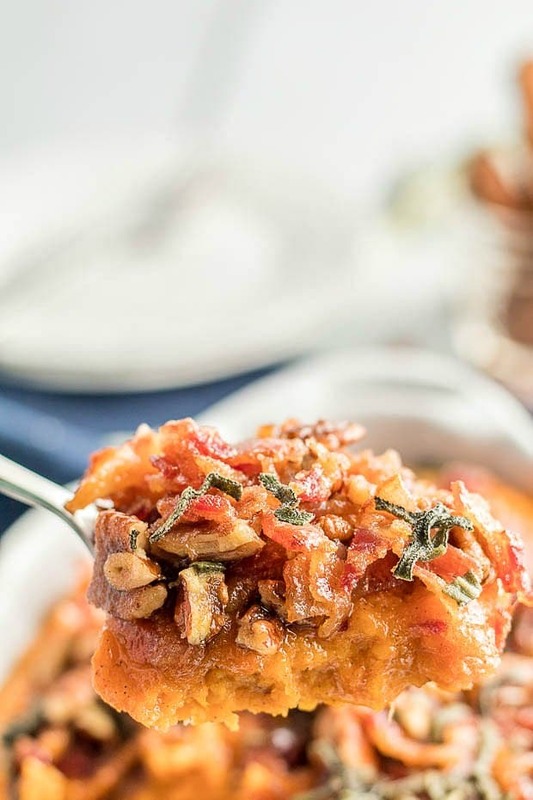 The caramelized brown sugar bacon topping is sure to wow your guests or hosts at the dinner table. If you want another take on this classic side dish, check our sweet potato casserole with marshmallows recipe as well. I love either dish paired with ham. Green bean casserole, vegetable casserole and corn pudding also make great sides! Our sweet potato casserole is sweet, salty, and spicy. The creamy sweet potato base is matched with a wonderfully spiced, nutty topping for maximum flavor and texture. 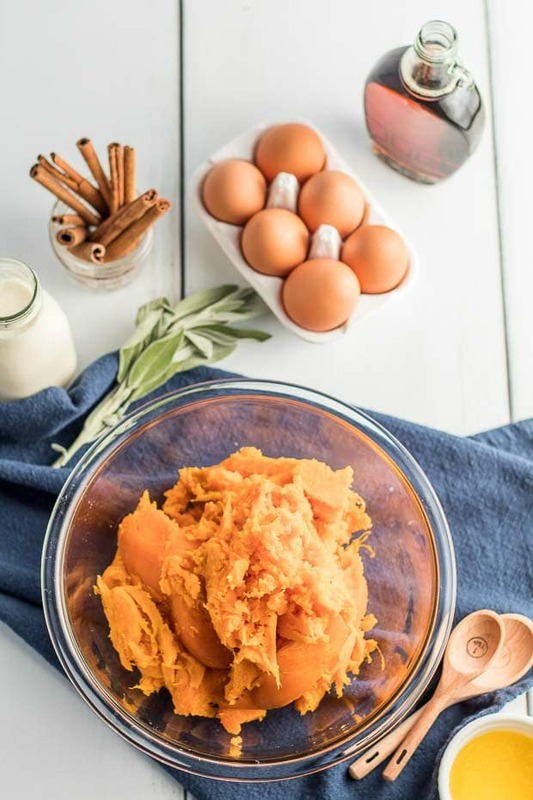 For the base, you’ll need some medium sweet potatoes, flavored with maple syrup, cinnamon, heavy whipping cream, melted butter, eggs, and salt. The topping is what brings this dish to life. It needs some cooked chopped bacon, brown sugar, pecan pieces, melted butter, cayenne, salt, and some chopped fresh sage for aroma. A lot of people get sweet potatoes and yams mixed up. What’s the difference? Sweet potatoes are long and have a tapered shape. They are usually smooth-skinned with a variety of different flesh colors, from yellow to red to beige. They’re fluffy and sweet when cooked. The ones we traditionally use for casseroles are brown skinned with orange flesh. There are so many ways to cook sweet potato. It can be baked, mashed, fried, and even made into soups and desserts. They’re a great source of beta-carotene, vitamin C, vitamin A, and fiber. Yams, on the other hand, have much rougher skin. They are also cylindrical in shape. The taste of a yam is much less sweet and more starchy. Cooked yams have also a drier texture. Their color range is usually more on the white to purple range rather than orange. They’re often eaten roasted, baked or fried. Yams are much more popular in Asian and African cuisine. For this recipe, make sure you’re buying sweet potatoes! Before the sweet potatoes can be made into your amazing casserole, they must be baked. Baking it concentrates its flavor while cooking, compared to boiling it first. The sweet potato loses flavor quickly in the boiling water, and your dish won’t be as sweet. Poke your sweet potatoes with a fork a few times to let steam out while it cooks. Bake on a sheet pan at 400. They will need about an hour and a half to cook fully. Once cooked, let them cool before continuing the process, or they’ll be too hot to handle when you’re trying to skin them. After cooling, remove and discard the sweet potato skins. Now, bring on the kids, this will be the fun step. Combine the skinned, baked sweet potatoes, maple syrup, cinnamon, whipped cream, butter, eggs, and some salt. My grandma used to let the kids mash the sweet potatoes with a potato masher. You can also mix with a hand mixer until smooth. Next comes the topping. Combine the bacon, brown sugar, pecans, butter, cayenne, and salt in a bowl. Grease up a casserole dish, and put in the sweet potato mixture. Top with your pecan sugar topping and sprinkle on your sage as a finishing touch. Bake at 350 degrees for 30 minutes until bubbling. The kitchen will smell of spices and brown sugar by now. It’s better than any candle I can find in stores. Let it rest for about 10 minutes so the casserole can set before serving. 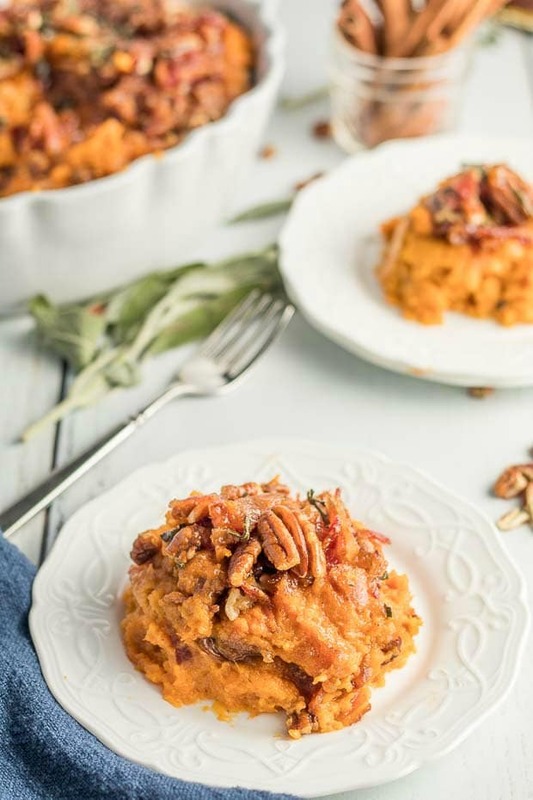 Get ready to receive many praises at the dinner table for this sweet potato casserole recipe! 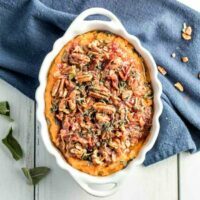 Sweet potato casseroles are a necessity for any big family gathering -- from Thanksgiving to Christmas to Easter -- including mine. After cooling, remove and discard the sweet potato skins. Combine the skinned, baked sweet potatoes, maple syrup, cinnamon, whipped cream, butter, eggs, and some salt. Bake at 350 degrees for 30 minutes until bubbling. Let it rest for about 10 minutes so the casserole can set before serving. My picky eaters were skeptical but in the end were begging for seconds.